Braselton, Ga. — It was a banner day for Scott Tucker and Level 5 Motorsports at Road Atlanta, as the team principal earned his fourth consecutive American Le Mans Series presented by Tequila Patrón championship with a thrilling victory in the series-ending Petit Le Mans Powered by Mazda. Tucker joined co-drivers Marino Franchitti and Ryan Briscoe on the top step of the podium Saturday evening following 1,000 miles of action-packed racing, which saw the team cap off its remarkable run in the ALMS. Tucker rewrote the record books yet again with his 99th career victory and 10th national driving championship, after only making his professional racing debut less than eight years ago. Having claimed 26 ALMS wins in only 38 starts, the Kansas City native ends his ALMS career with a remarkable 68 percent win record. What’s more, Tucker stands 12th on the all-time win list, in the midst of some of the world’s greatest sports car drivers, while also being tied for third in the all-time ALMS driver’s championships. "This year was a long road,” said Tucker, who claimed his fourth consecutive Petit Le Mans victory to go with his four-peat at Sebring. “We had a pretty good plan going in. The Level 5 guys did a great job. My co-drivers this year, Ryan and Marino, these are the best guys I've had with me. I'm really proud to have them. The team did a great job. The ESM guys were good, strong competitors this year and we were fortunate to be able to race against them. Overall, I'm just really happy for the result we achieved. We put the work in for it so I feel like we deserve it." Level 5’s No. 551 Siemens/Alpina Watches/Ohiya Casino Resort-sponsored Honda Performance Development ARX-03b prototype bounced back from a challenging first half of the race, which was mixed with changing weather conditions, to take the fight to the No. 01 ESM car. An impressive closing stint by Briscoe, and a quicker final fuel-only pit stop for the David Stone-led organization, got the IndyCar star out ahead of rival David Brabham. From there, Briscoe managed to expand his margin, taking the checkered flag for his 5th win of the season and the team’s 9th in 10 races. It capped off a remarkable season that also saw Level 5 become one of the most successful organizations in ALMS history with four consecutive team’s titles, matching the likes of Audi Sport and Alex Job Racing in the record books. "It was a really tough race for us today," Briscoe said. "It was definitely an uphill battle. I wasn't sure if we were able to get back on the lead lap. But one thing was for sure: Nobody on the team was going to give up. It was definitely one of those deals today where we kept on fighting. We double stinted soft tires in the middle of the day and ran really fast lap times. "I got back in the car late and had a really good battle with Brabs,” Briscoe continued. “We got him on the last pit stop with the splash and dash. They had a little miscue in pit lane and once again our Level 5 guys just executed absolutely 100 percent, no mistakes at all. Hats off to the entire team for that. We had the speed to hold him off. I couldn't believe it when we were leading the thing and taking the win. Great effort by everybody and great job by Scott on the championship. He puts in a huge effort and it's great to see." Franchitti notched his fifth class victory of the season. With the win, the Scot becomes a three-time Petit Le Mans champion, with previous wins in 2010 and 2011, along with a runner-up finish with Level 5 last year. "I'm obviously delighted we got Scott the championship," he said. "That was the goal from the start of the year. It was a great battle with ESM. I think Brabs really came in and put his foot down in that team. I'm just really proud of the guys to come back from where we were. “I thought it was going to be like the last two years where we were really strong and things were conspiring against us to get the victory,” Franchitti continued. 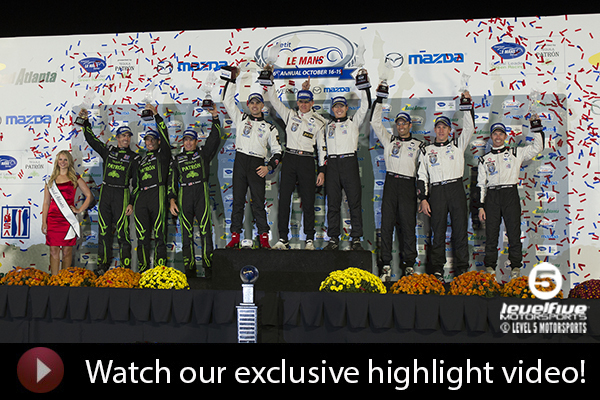 “I'm delighted to win again at Petit Le Mans. I'm delighted for Scott to get the championship. To bookend the year with Sebring and Petit with Ryan was really special."